What can you see when you go walkabout on Groote Eylandt? When We Go Walkabout shares some of the wonderful animals you can find in this remote Australian location – wallaby, crocodile, swordfish, caterpillar, stingray and more. When We Go Walkabout, or Yirruwa Yirrilikenuma-langwa, has simple text by Rhoda Lalara written in both English and Anindilyakwa, the local Indigenous language of Groote Eylandt. The gorgeous illustrations by artist and ANKAAA (Association of Northern, Kimberley and Arnhem Aboriginal Artists) Director Alfred Lalara show the landscape and wildlife of the area. Alfred was assisted with some of the raak cross-hatching on the illustrations in the book, including the borders and endpapers, by his wife Alice Durilla. This is a wonderful book to introduce young children to Australian wildlife as well as giving them a glimpse into the Indigenous culture of Groote Eylandt, which is located on the western side of the Gulf of Carpentaria, about 640 kilometres from Darwin. The Warnindilyakwa are the Traditional Owners of the Groote Eylandt archipelago and their ancient language Anindilyakwa is still spoken on Groote Island and nearby Bickerton Island by the Warnindilyakwa people today. For those who wish to attempt the Anindilyakwa version of the story, the book includes a QR code that will take you to a recording of Rhoda Lalara reading the story aloud. You can also find the recording on the Allen & Unwin Soundcloud account here. 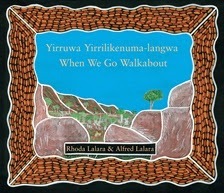 When We Go Walkabout / Yirruwa Yirrilikenuma-langwa is a wonderful book to have on your bookshelf at home and is it particularly useful as a classroom resource for exploring Aboriginal art and culture.